Basilica Cattedrale Patriarcale di San Marco (St. Mark's Basilica) during the day and under some renovation. This has to be one of my favorite photographs that I captured during my whole trip, it has so much depth and character. I also like the photo I captured of our Gondolier, it has that "Humans of New York" feel to it that made me keep it and not delete it from my camera. | ABOVE x BELOW | The famous Grand Canal which is runs all throughout the center of Venice in a shape of an S, eventually leading off on one side to the Venetian Lagoon and the other to Saint Mark Basin. One of my travel companions, Sandy of Madly Addictive looking pretty good center stage while on our gondola ride. 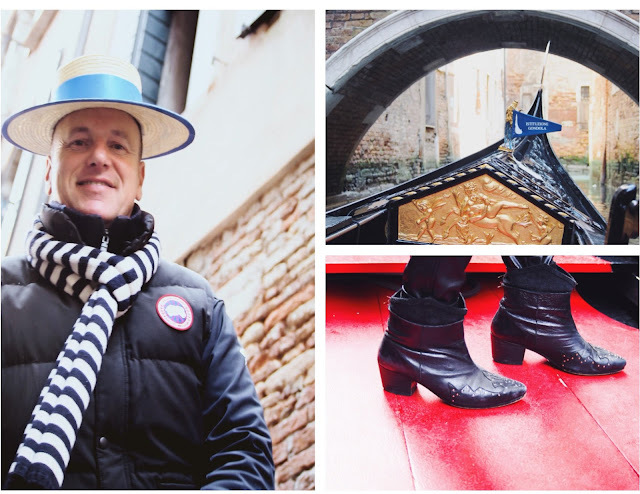 Yes I borrowed our gondolier's boater hat, because all of you know just how much I love hats. I regret not buying one of these cuties while I was there, but it gives me a good excuse to go back. The beauty behind Venice, I believe stands behind all of these worn out buildings that reveal such a charming aesthetic, one that I hope to replicate when I have my own home. I capturing them, they capturing us, isn't that something special? We both will exist and transcend in each other's lives throughout time in this image. My other travel companion being all cute and stuff with the same boater hat I borrowed from our gondolier. The outfit I one day want to copy, I find it charming and oddly very chic. Isn't these building a beauty? truly stunning in my eyes. Hope you enjoyed my CHIC Travel photography of a Girls Trip to Italy | Venice. In case you missed the first two, see Part I x Part II. Stay tuned, because next up is Florence. LOVE these shots! Absolutely breathtaking...especially those Moorish windows.